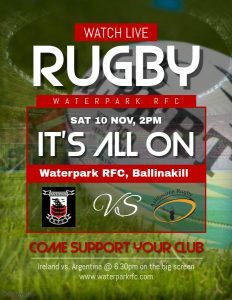 Waterpark RFC taken on Ashbourne RFC in the Quarter Final of the All Ireland cup at 2 pm in Ballinakill. Why not come down for what is sure to be a great game of live rugby as we take on Ashbourne who are current holders of the Cup. Later on why not take in the Ireland v Argentina on the big screen!